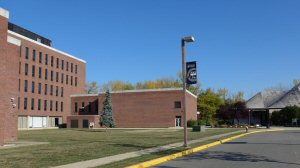 The Rothman Center, and Dickinson Hall including Wilson Auditorium, are located on the Hackensack side of the campus. View a Google Map showing Dickinson Hall and Rothman Center. From Route 4, traveling east (from Garden State Parkway) exit at Hackensack Avenue (immediately following the Main Street Exit), heading south. Proceed to second traffic light at Temple Avenue, turning left. Dickinson Hall is located at the end of Temple Avenue on the left; parking is on the right. From Route 4, traveling west (from George Washington Bridge), exit at the second Hackensack Avenue Exit (the Business District). Proceed to the second traffic light at Temple Avenue. Dickinson Hall is located at the end of Temple Avenue on the left; parking is on the right. From the Garden State Parkway (heading north) take the Garden State Parkway North to Exit 161 (Route 4 East). Travel on Route 4 until reaching Hackensack Avenue. Follow DIRECTIONS #1. From Garden State Parkway (heading south) exit on left onto Rt. 17 South. Proceed to Rt. 4 East. Travel on Route 4 until reaching Hackensack Avenue. Follow DIRECTIONS #1. From New Jersey Turnpike (South) take the New Jersey Turnpike to Exit 11 to the Garden State Parkway North. Take Garden State Parkway Exit 161 to Route 4 East. Follow DIRECTIONS #1. From Route 80, traveling east (NOTE: From LOCAL 80 ONLY. You can not exit from Express 80) Exit at Hudson Street-Hackensack-Little Ferry Exit. At end of ramp, turn left toward Hackensack on HudsonStreet. Continue until road ends, turning left toward Hackensack. At first traffic light, turn right and proceed until road ends. Turn left onto River Street (which becomes Hackensack Avenue). Drive straight through to Hackensack (approx. 5 minutes). After passing light at Sears Roebuck, continue to second traffic light, turning right onto Temple Avenue. Dickinson Hall is located at the end of Temple Avenue on the left; parking is on the right. From Route 80, traveling west. (NOTE: From LOCAL 80 ONLY. You cannot exit from Express 80.) Exit at the Hudson Street-Hackensack-Little Ferry Exit. Proceed through traffic light (Hudson Street) to nextlight. Turn left on River Street and follow DIRECTIONS #6. From left to right, Dickinson Hall, Wilson Auditorium, and Rothman Athletic Center, as viewed from visitor parking lot. Main entry doors to Dickinson and Wilson are on far side (east side) of the building. Kron Building, residence halls, and academic buildings including University, Muscarelle, Robison Hall, and Robison Annex are located on the Teaneck side of the campus. The Metropolitan Campus can be reached from such major routes as the Garden State Parkway, Route 80, Route 4 and the George Washington Bridge. From North: Take the Garden State Parkway south to Exit 163 to Route 17 South, then stay right for flyover onto Route 4 East. Exit Route 4 at River Road. Campus parking is on the right. From South: Take the Garden State Parkway north to Exit 161 to Route 4 East. Exit Route 4 at River Road. Campus parking is on the right. From West: Follow Route 80 to the Garden State Parkway North. Proceed on Garden State Parkway to Exit 161 (Route 4 East). Follow Route 4 to River Road exit. Campus parking is on the right. From East: Take the George Washington Bridge, follow signs to Route 4 West. Exit Route 4 at River Road. Campus parking is to the left, past the athletic fields. Frequent bus service to and from New York City (Port Authority is about a 35 minute ride) serves stops at River Road in Teaneck on Route 4. Contact NJ Transit 973-275-5555 for exact schedules or call our Public Safety Department at 201-692-2222. Out-of-state and international students can reach the campus from three major regional airports. The closest airport is New Jersey’s Newark Liberty International Airport which is about a 30-minute drive. Many students also fly into JFK International or LaGuardia Airport in New York City.